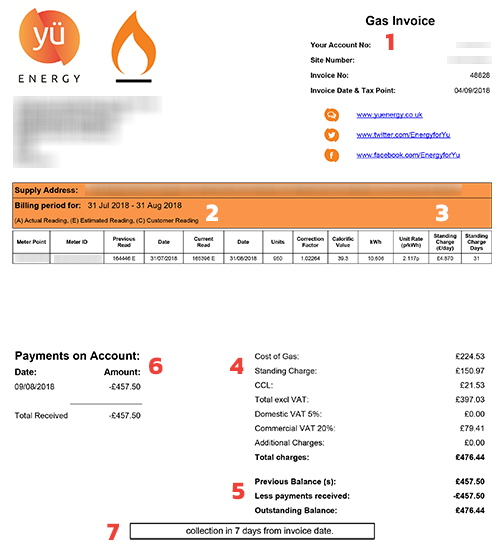 Everything you need to understand your business gas bill. Your gas bill has been designed so it’s easy to understand, however we understand this can be a little tricky. 3 Standing charge – The standing charge is the cost you pay to us, in order to access your energy. 4 Overview of this month’s invoice – Highlighting all additional charges as highlighted in your contract charges and VAT. 5 Previous months invoice – Highlighting any adjustments (default fees/ad hoc credits)/payments since your last monthly invoice. 6 Total amount – This figure shows how much will be taken from your account (if a minus number is shown, your account is in credit). come out of your account – these dates differ depending on your agreed contract.